I have sold at the bottom far more times than I care to admit. However, if this is another occasion so be it - Sayonara, Au Revoir, Adios Gold stocks. I purchased my first gold stock, Royal Gold, in May of 2002. At the time, I really didn't know much about gold or gold stocks and had no idea that it was the beginning of a bull market in gold. Royal Gold met the criteria of a screen that I was using at the time and it simply was one of many stocks that popped out. The trade didn't work as I had hoped. After a quick 20% haircut, I sold it three weeks later. This didn't discourage me. As I read more about gold, I realized that something special was in the makings. The first part of 2003 wasn't much better. I had more losses with Glamis Gold, Agnico-Eagle Mines (AEM) and Anglogold (AU). However, around mid year my fortunes changed for the better. The winners started coming 5%, 10%, 20%, 30%, 250%. Yes, I turned a 250% profit on a trade of Golden Star Resources (GSS). Needless to say, I was hooked at that point. The beauty of Gold stocks is that they are leveraged to the price of gold. Since a significant part of a gold mining company's expenses are fixed, their profits increase substantially as the price of gold increases. Therefore, your profit potential is much greater than investing directly in bullion. Obviously, there is no free lunch. By purchasing the stock instead of the bullion, you are taking on company specific risk such labor disputes, environmental and political issues as well as just plain poor management. The graph below illustrates the relative performance of Gold stocks, as represented by the Philadelphia Gold and Silver Index (XAU), versus Gold bullion. 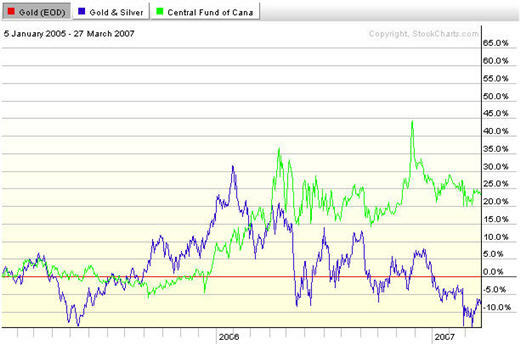 In this graph Gold is held constant, while and the relative performance of the XAU is illustrated. 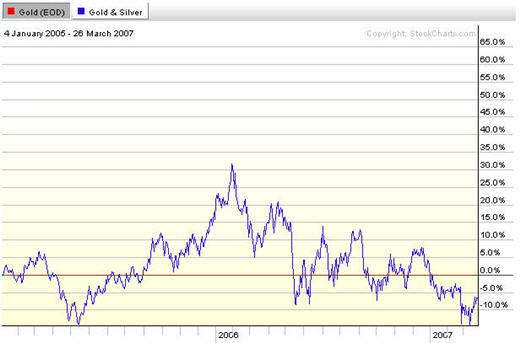 As you can see, Gold stocks consistently outperformed Gold from 2002-2004 except for a few brief periods. The next graph captures the same relationship from 2005 to date. Since 2005, Gold Stocks have spent quite a bit of time underperforming Gold. Also all of its peaks are lower than the ones from 2002-2004. What happened? Why have Gold Stocks lost their luster? On November, 18 2004 the Gold bullion ETF (GLD) was launched. I remember the excitement amongst the gold community - thinking that GLD would bring incremental buying from the mainstream since it was only a mouse click away. 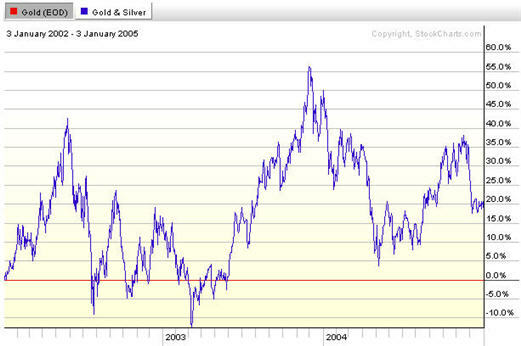 However, immediately after the launch Gold stocks started selling off. Before GLD, the only way for many institutional fund managers to participate in Gold market was through mining stocks. Most were prohibited from directly purchasing bullion. I believe that many institutions no longer saw a need to hold a proxy for Gold when it could hold the actual commodity through GLD. Why deal with the company specific risk? The loss of institutional ownership, I believe, is one of the primary reasons that Gold Stocks have lost much of its leverage to gold. Losing its leverage is one thing, but out-right underperformance is something completely different. I have heard all kinds of reasons. The most common one is that Gold mining company's input costs have increased much faster than the price of gold. That may be true, but oil is not the culprit. From 2002-2004, oil increased an average of 33% annually versus 22% from 2005-to date. At this point, I don't know what the cause is for gold stocks underperformance and I really don't care. What's the point of owning the stocks – if they can't outperform bullion? Anyway, we are in the midst of a gold bull market – not necessarily a gold stock bull market. So, why not do like the institutions and dump the Gold stocks for GLD? A better alternative to GLD may be the Central Fund of Canada (CEF). Let's take a look at CEF's performance versus gold and gold stocks. The silver component in CEF provides the leverage that attracted me to the Gold Stocks without any of the company specific risks. I have written on numerous occasions that I think CEF is the best way for the average investor to leverage the gold bull market. Simple dollar cost average will generate outstanding returns.